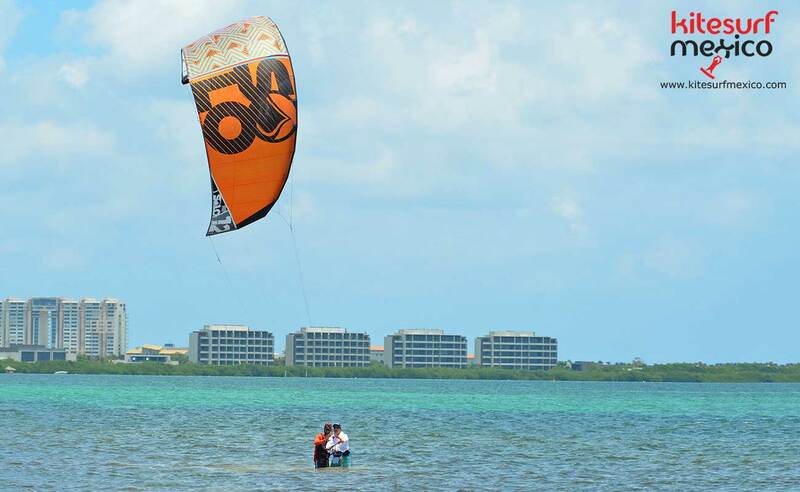 Cancun is one of the best spots in the world for learning kiteboarding. 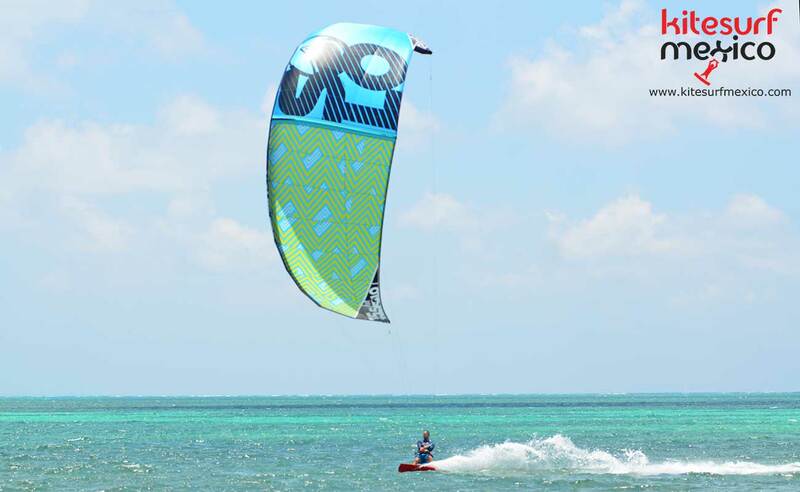 Spots like Nizuc and Isla Blanca are a true paradise for kiteboarding beginners. The conditions of the place chosen for learning kiteboarding have a great impact on the learning process. The learning curve can be reduced a great deal if a spot with shallow and flat waters is selected. 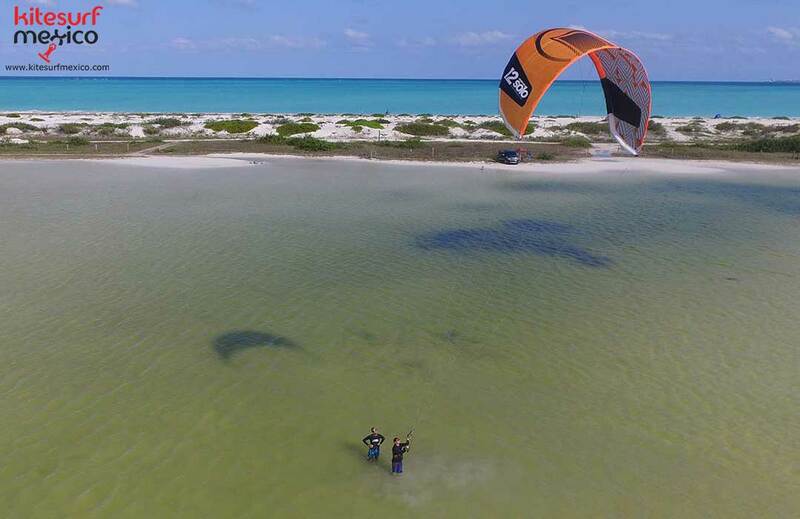 Shallow waters allow the student to walk without having to swim all the time when still learning and kite controlling has not been perfected yet. Being able to retrieve the board walking is another advantage of the shallow waters in these places. Another advantage of learning kiteboarding in Cancun is that the lack of wave makes for students to be more at ease and feel more confident at these important stages. 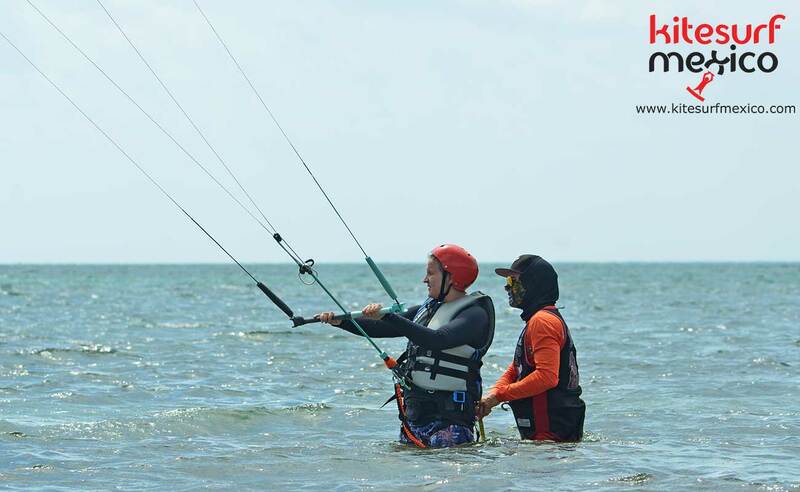 Wave can cause problems when practicing kite controlling without the board and also, when it is time to get on the board to start riding. It is very complicated for a beginner kiteboarder to having to jump waves, regardless of their size. It is a lot easier to practice on flat waters and just focus on riding without having to jump or change direction in order to go past the white waters. The warm weather year-round is another plus. In Cancun, the water is always warm, it never gets lowers than 24⁰ C. This helps a lot, since cold waters demands more body energy. In cold waters, the body must work more in order to keep warm, which demands more energy and focus from the student. Every year, more and more people choose these spots for practicing and learning kiteboarding. The combination of nature and comfort that this area of Mexico offers is almost unique in the world. Besides, the great range of activities in this area makes it a perfect destination for the whole family. While some family members practice kiteboarding, others have a great number of activities to choose from, such as snorkeling, scuba diving, visiting cenotes, Mayan ruins, etc. As for food options, the Mexican gastronomy has a lot of variety to offer, with dishes of all kinds, but there are also international restaurants with foods from all over the world, so you just have to choose according to your preferences. Here you can find lodging of different types and prices. From large all-inclusive hotels to small ones with different categories, or even the possibility of renting a house or a room on Airbnb. 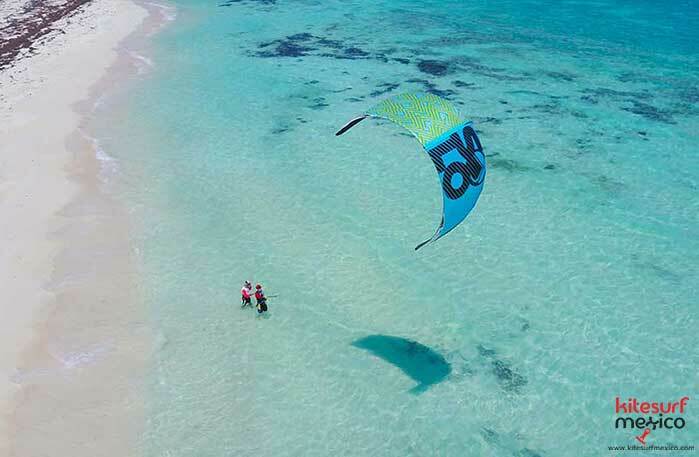 What is the best season for learning kiteboarding in Cancun? The good winds for practicing kiteboarding start in November, with the arrival of the first north winds. Sometimes it can start earlier, in October, but the winds are more consistent from late November to May/ June. In the last few years, with the global weather changes, the kiteboarding season has been changing a lot every year. It used to be easier to have more accurate weather forecasts for choosing the best months. The “norths” arrive from Canada and the US to Mexico during November, December, January, February and March, sometimes even May. On “north” days, temperatures can drop a little. During those days, it might be necessary to wear a 2-3 mm for protection against the cold weather. 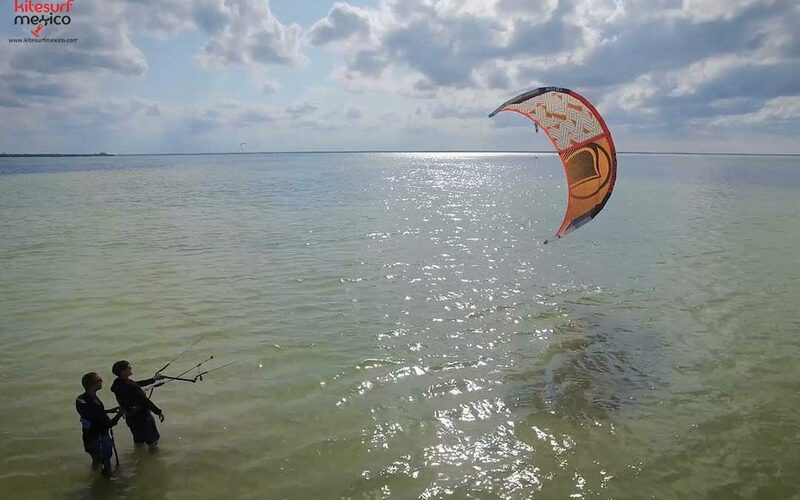 During the kiteboarding season, the dominant winds are from S, SE, E, NE and N.
With the north winds, kiteboarding is possible only in Isla Blanca. Other wind directions allow for practicing in Nizuc as well. If you are an advanced kiteboarder, you can also go kiteboarding in the hotel zone in Cancun, where there is more swell, but let’s be honest; it is also fun to play with the waves. If you arrive to Cancun in June and July, you also have the option of going to El Cuyo, where thermal winds are present during those months. Contact us in case you require classes in Cancun, as well as kite gear rental, tours, kite trips.